The epic mountain of U.S. oil is starting to shrink. The amount of crude oil stashed in storage tanks plunged last week by more than 4 million barrels. It was the sixth-straight week of declines, according to government stats released on Wednesday. That's a dramatic shift from just a few months ago when fears were rising that the U.S. was running out of room to store all the crude being pumped. Oil prices crashed to $26 a barrel in February, in part driven by these fears. So does this recent reduction mean the massive supply glut is fading? Not so fast. 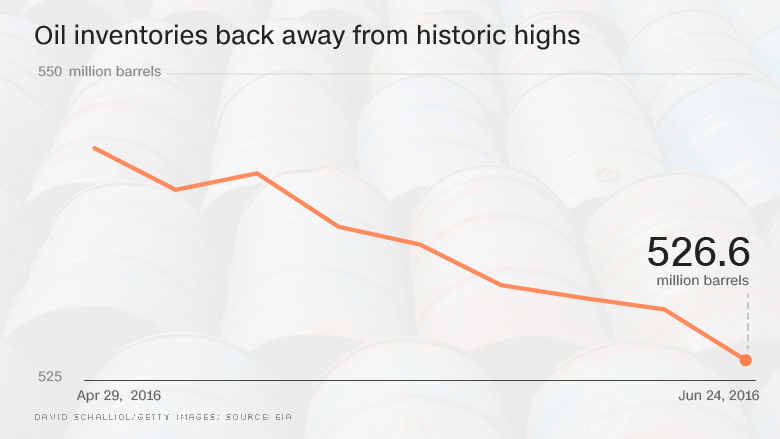 It's important to remember that oil inventories are still at ridiculously high levels. As recently as April, they soared to 543.3 million barrels -- the highest level in 86 years. Yes, years. But since May, oil stockpiles have been drawn down, even if it's only by 3%. The reason is seasonal. Oil inventories shrink as the summer driving season starts to kick into full gear. Refiners that are sidelined for maintenance during the winter and early spring months ramp up again in anticipation of stronger gasoline demand. 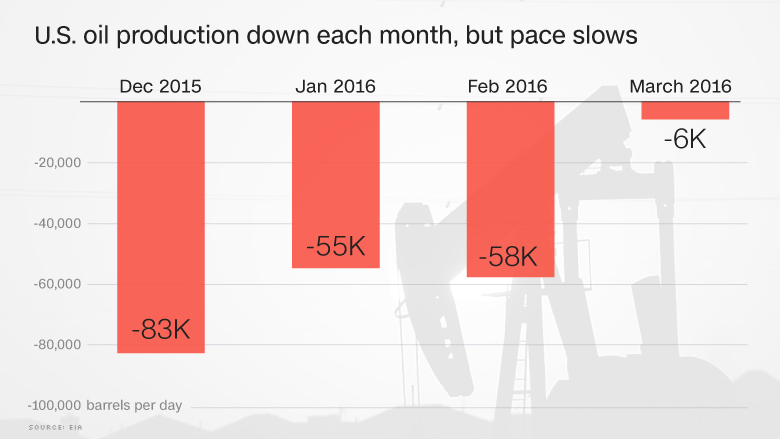 The same thing happened last year when U.S. oil inventories began declining late in April. In fact, this seasonal effect was more dramatic then, with stockpiles going down more sharply than this year. "Crude stockpiles are still crazy high in the U.S., even though we've come down seasonally. 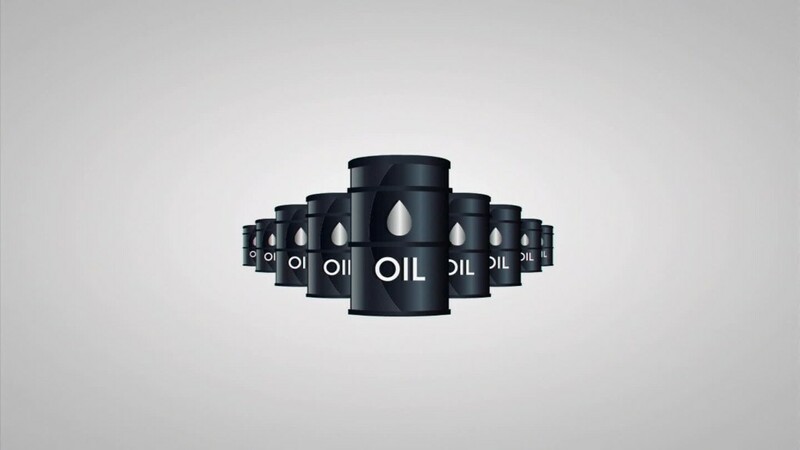 A lot of people are missing that fact," said Mike Wittner, global head of oil research at Societe Generale. Wittner said that while the extremely high level of inventories is not building anymore, "it's also not coming down much either." In other words, the epic oil glut isn't gone. Stockpiles are actually higher by 71 million barrels than the same time in 2015. The seasonal nature of the inventory declines hasn't prevented oil bulls from cheering though. Crude soared 3.5% on Wednesday to $49.50 a barrel, making up more ground lost during the Brexit market turmoil from late last week and Monday. Rebalancing process continues: Of course, there are good reasons for oil prices to have nearly doubled since mid-February. Unexpected supply outages in Canada and Nigeria helped ease the oversupply situation. Oil demand has held up reasonably well, despite the sluggish global economy. And U.S. oil production has declined from the 2015 peak, albeit gradually as of March, the last month the government has stats on. "The market is looking forward to a global balance, which is a huge inflection point, but it's something that hasn't happened yet or has only started to because of disruptions," said Wittner. Those supply outages, especially in Canada, are already starting to fade. That's why Wittner said he's "cautious" about where oil prices are heading this year. Beware of the gas glut: The other important thing to watch is the lingering glut in inventories of refined products like gasoline. Stockpiles of gasoline rose last week by 1.4 million barrels, much more than expected. "That's keeping gasoline prices low. Consumers have responded by driving more," said Rob Thummel, a portfolio manager at energy investment firm Tortoise Capital. But Matt Smith, director of commodity research at ClipperData, thinks the gasoline glut may be a sign of a "bearish scenario" emerging on the refinery front. He said refinery margins have dropped considerably compared with last year, suggesting refiners have less incentive to turn crude into gasoline. "I think we'll see refiners continuing to dial back on refining, meaning less demand for that crude," said Smith.